here's a confession: ever since i was a kid, i've really, really loved stationery. i always got really excited about back-to-school shopping - not really because of the school part, but because it meant getting new stationery supplies for the year. for me, this is the perfect marriage of my left-brain and right-brain tendencies. my nerdy pleasure of browsing through an office-supply store was balanced out with the idea that some sort of perfect everyday world involved notebooks, pens, and planners that fused organizational function with elegant design. after all, if you have to make your monthly budget or plan out the next week's appointments, isn't it always more romantic to write it on a nice leather-bound planner? fast forward to our present age, the age of smartphones and iCalendars and digital everything. i'm certainly no luddite when it comes to sleek gadgets, but in the early 2000s i tried the PDA and hated it. back to the old-school planner. writing things down is really a pleasure that is worth preserving. i still like to write thank-you notes and holiday cards to friends. and for everyday, nothing beats the small but wonderful feeling of accomplishment that comes with crossing out a bunch of to-dos on my list. 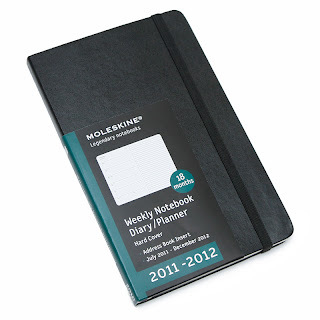 my current and everyday 'analog' must-have is the Moleskine 18-month hardcover planner. (i also love this rad pac-man moleskine planner!) it's minimalist, sleek, and designed with everything i need without any unnecessary frills. the other must-have would be my blackberry, which has taken the place of my address book for managing contact info and directions (thank goodness for google maps!). the keypad, as antiquated as it is in our touchscreen age, is also great for messaging and email. 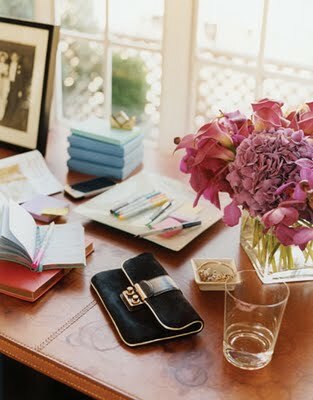 what do you use to keep yourself organized? my crackberry is on its final legs after almost 4 years (and being dropped countless times...), so i'm looking to get a new phone soon that can also be used internationally. if anyone has any recommendations (i'm still a bit dubious about the iphone), do let me know! I did try to use the iCalendar but no success, it seems that the act of writing down an appointment makes it easier to remember. I use a mini moleskine diary, that fits even on my smallest bag. Now I use an iPhone, which I think has more pros than cons, and it's very good looking :) (though I used to have a Palm Pre and was in love with it for a long time, it has more apps than the Blackberry). haha I am a nerd when it comes down to stationary, too. I used to experiment with different kind of agenda awhile back but for the past five or perhaps longer years I've been loyal to the Moleskine planner. Other stuff just does not feel right. I'm still a bit skeptical about putting so much information into cellphone so i write down my address in the moleskine, too. I carry a rugged cellphone with no big screen or email. (and i will probably be utterly lost in the next decade). I still keep a planner. It's easier for me write things down with pencil than typing it into a phone. I don't have a "fancy" phone, and no desire to have one. Like you, I'm not into the whole touch screen business. I think if I were a busier person I would consider a PDA. Digital really cannot compare to the beauty of paper stationary. It's much easier to scribble down notes and appts into a notebook - I use a Moleskine planner too, and I love the pocket behind, good for namecards, receipts, etc. I'm not giving up a real notebook anytime soon. 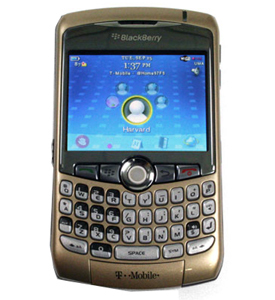 I'm using a Blackberry - I need a 3G smartphone mainly for work (emails), but I love that I can chat with friends who live overseas through IM services like BB messenger and Whatsapp without incurring scary phone bills. I also enjoy reading news on the go. But the iPhone (I had one) is definitely way better in terms of its attractive interface, and the fact that surfing the web is much easier and nicer, because a lot of companies design their websites to be viewed on an iPhone browser. The same cannot be said for BB. But you can try other phones with Android OS...I haven't tried so I don;t for sure. Plus, an iPhone is an fantastic travel companion - they've put in a decent camera and video cam, you can download maps and guides to use offline instead dealing with unwieldy paper maps and guidebooks, and it's also an iPod. Where there;s wireless, you can also keep in touch with home over the Internet. the iPhone isn't the only phone that does all this stuff but it's certainly the most beautifully designed and easiest to use. I loved my friend's HTC phone, very beautiful also, but much more confusing to navigate. I hate to be one of the millions shilling for an iPhone and I'm not at all a gadget person, but it is really a good product, haha. I used to be a total stationery nut, and still have a shelf devoted to letter paper in my room :) But after getting the iPad I find myself using that for almost everything - notes, calendar, etc. Of course my cheap reporter's pads and pens are still important for work. But for sheer pleasure, I love the iPad. And my Nokia E63 is a great phone for quick memos, calendars and email. But I tend to use it less and less as a smartphone, and more as a regular mobile. Cato: ooh - which bb are you using? i love the iphone design but am not sure how user friendly it will be for texting/email. nanashi: the moleskine is great! i had the small red one but i'm switching to the larger version - more space to jot things down, and i like the other format of the week on one side and the notes page on the other. i wish they made this version with the red cover! your 'rugged' cell phone has me wondering - who makes it? and can you use it when you're abroad? k.line: i think the other thing i'm concerned about is the cost of the mobile contract for iphones...i'll have to see if there are more reasonable cell plans now. lin: that's the thing that bugs me - it seems like the iphone is primarily a 'play phone', whereas the blackberry is clunky in its interface but really gets the job done for emails/texts. i wish they combined functionalities! i like that you can take out the SIM card in your bb and put in another one when you're overseas, though. not sure how iphone works for that. Ammu: i'm just afraid of losing everything on digital, so there's something of the permanence of writing things down on paper that appeals to me. :) i'll have to check out Nokia and Motorola for their Droid options. is your Nokia easy to use for typing/messaging? OMG, I used to get really excited about getting new school supplies too! And, I also still love office supply stores. I'm somewhere between using my iCal and writing everything down. Lately, I've been relying on my iCal because I sit in front of my computer all day, so it's easy to just switch on and view. When I'm teaching or away from my computer for significant parts of the day, I revert to my old habits of writing everything down in my Moleskine. I use the 12-month weekly horizontal planner. I still prefer writing everything down. OOh dear, I relate so much to this post. I was even thinking of doing an exact (well, maybe not exact) same one! That's why I love MUJI so much. I'm also a Moleskine junkie, except I have a red weekly planner (because it's the only version that starts in September and goes all the way to June - it's schoolar-calendar inspired) and a black plain one. I also use my phone for quick notes but there's nothing like writing, sketching and not accidentally delete! Moleskine weekly notebook all the way. I love having the days of the week down one side and a page for to-do lists on the other. I've bought the pocket size for the last few years but I think next year I'll upgrade to A5 to fit more in. jennifer: hehe, glad that our blogosphere here is also full of Moleskine and stationery fans! Maja: thanks for the HTC tip! will have to check that out. i used to do the same for my planners! Kate: isn't it genius?? i used the horizontal week version for 2 years but realized that i need a weekly page for notes and to-dos. i just ordered the 8x5 size planner. should be the perfect size!